Decks are a great addition to any home. Like any room inside your house, decks need to be cleaned and maintained on an annual basis so they remain safe and enjoyable. By doing what’s good for the material of your deck, you’ll get more life from your outdoor living space. Maintaining the appearance of your home shows pride in where you live, but that isn’t limited to just painting and landscaping. 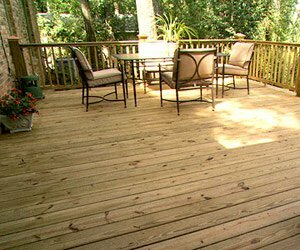 Decks are used every year by families to entertain and they should receive the same amount of care and maintenance other parts of your home receive. The best time to complete some maintenance work on your deck is during the late Spring. It should be swept off to clean off any loose debris, especially leaves and dirt. 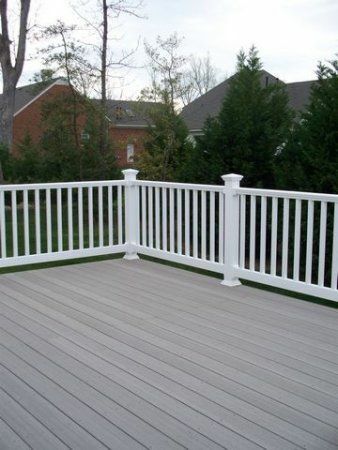 These things can cause staining and discoloration of your deck surface. Some other things that can cause discoloration or staining to your deck are flower planters that are not properly elevated, as well as grills without grease traps. These traps help keep the grease from dripping onto your deck—if grease does land on your deck surface, the stains will be very complicated to remove. 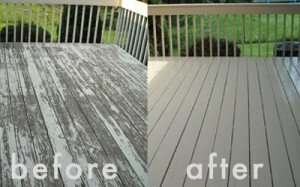 Cleaning the deck and painting or staining the surface are great ways to keep your deck looking new. Having a professional come every 2 to 3 years to clean and seal your deck will definitely save you time and money in the long run rather than trying to complete it yourself. Professional companies use top of the line products that are meant to hold up to the wear and tear weather-wise and entertainment-wise. Sometimes, a company may recommend to have the deck power washed before having any other products put onto the surface. Make sure you leave this step to the professionals; renting a power-washer can sometimes lead to more repairs than needed. If the pressure is too high for the material of your deck, it can ruin the top layer of wood and end up costing the consumer more money.